Dominaria preorders are open with distributors everywhere, and WPN members are eligible to sell advance booster boxes at Prerelease—a week before street date—in quantities equal to the number of Buy-a-Box promos they receive. 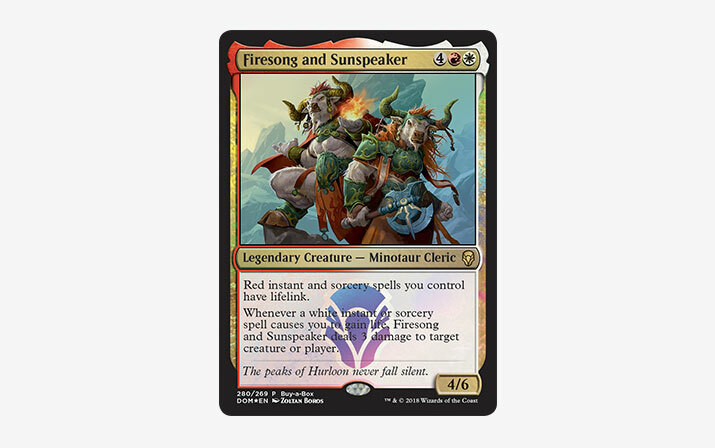 For the first time ever, the set includes a foil, Standard-and-Commander-legal rare that is only available through the Buy-a-Box promotion. It's not in booster packs. It's not in Bundles. It's not in any store outside of the Wizards Play Network. R&D designed this card specifically to be Dominaria's Buy-a-Box promo. The target was casual and Commander players—to motivate them to pick up a box early, rather than wait and update their decks piece by piece. Plus, being exclusive, it's got appeal for collectors. And while it's not a likely powerhouse in Standard, it could easily find a home in decks outside of tier one. But we're especially excited about its implications for Brawl, a new Commander variant using only Standard-legal cards. Read more about the format from designer Gavin Verhey here. The promos are on their way now and will be landing in your store soon. Players can preorder a full display to earn one and pick it up at Prerelease (while supplies last), starting on April 21. Contact your distributor to place or boost your Dominaria preorder today.